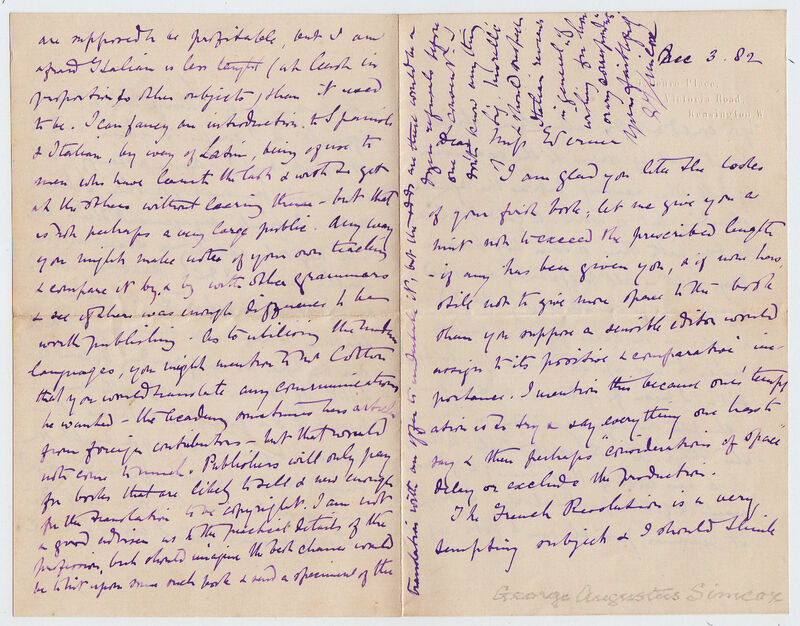 A long Autograph Letter Signed, to Miss Werner, giving detailed advice on the writing of books and articles, suggesting subjects, the daily routine of a writer, etc. 4 pp. 7 x 4½ inches, fine. 1 Douro Place, Victoria Road, Kensington, 3 December 1882. George Augustus Simcox (1841–1905), classical scholar and poet. He was also a critic and busy literary reviewer, in magazines such as the Argosy, the Fortnightly Review and the Academy; and essayist for The Nation. He published some substantial poems, on Arthurian themes in particular.